Christmas helmet 2013 looks delicious. Gloss paint says it takes 16 hours to dry. I can confirm that is true. After literally watching paint dry for all of 12 seconds I got too excited so wore it out. Gloss paint is really hard to get out your hair. In case you were wondering, you can't take a Christmas tree home on a BMX. A tandem on the other hand, that you can do. It's like pannier bags were made for this. You get a discount if you say you are taking your tree home on a tandem. And an audience. 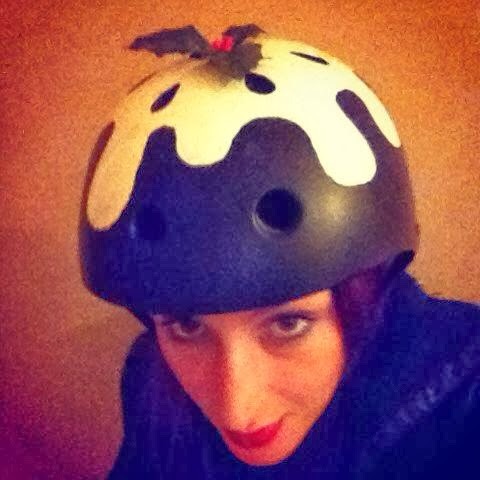 All I want for Christmas is.... to ride around all day in my pudding helmet.